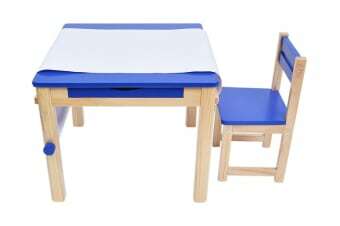 Constructed from exceptional quality New Zealand pine, the TikkTokk Little BOSS Table and Chair Set is the perfect addition to any child’s playroom or bedroom. Perfect as an art station, this amazing TikkTokk table set features an integrated paper roll holder and cutter so your child can easily access drawing paper and create all kinds of masterpieces. The included drawer also offers space for them to place pens, pencils and other art essentials, keeping everything neat and tidy.